This might be one of the Japanese cultures. Especially in urban areas in Japan, it is normal that big stations have shopping malls inside themselves or in their adjoining places. 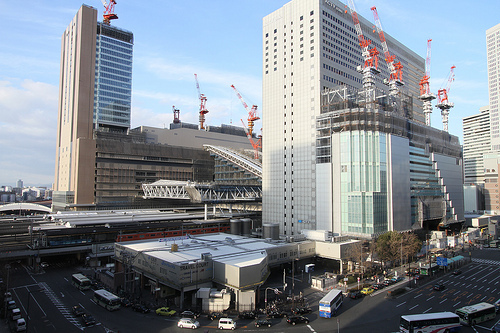 For example, around Osaka station, there are 3 department stores, so station users can reach the shops directly from ticket gates. 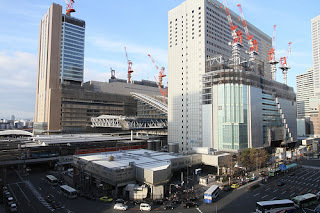 We call this kind of station with shopping malls "Ekibiru", "Eki" means station and "biru" means building, and which expresses "the combination of station and shopping mall". According to certain information, this concept started before World War 2. At that time, some private railroad companies in urban area tried to make department stores near terminal stations in order to make people living in the suburbs use the trains and the stores often. I think this concept was made by Japanese.